In a blow to Democrats, a Republican candidate captured the heavily Jewish New York City congressional district previously represented by Rep. Anthony Weiner. The Republican candidate, Bob Turner, beat his Democratic opponent, New York State Assemblyman David Weprin, in Tuesday’s special election. The Associated Press called the race for Turner shortly after midnight, with the Republican leading Weprin by a margin of 53 percent to 47 percent and more than three-fifths of precincts reporting. The race was closely watched as a measure of attitudes toward President Obama, with the Jewish vote a particular focus of attention. Former New York City mayor Ed Koch, a Democrat, urged voters to support Turner in order to send a message of dissatisfaction to President Obama over his policies toward Israel. 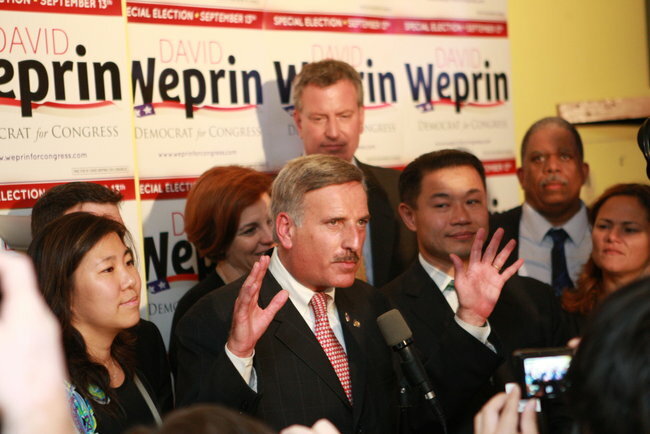 Weprin, an Orthodox Jew, initially led in pre-election polls. But Turner, a retired television executive who was a creator of “The Jerry Springer Show,” pulled ahead during the past month. Turner’s victory came despite the Democrats’ strong advantage in voter registration in the middle-class Brooklyn and Queens district, which is 57 percent Democratic and only 19 percent Republican. Observers, however, have noted that the district votes more conservative than the registration numbers seem to suggest. The Republican’s tenure in Congress, however, could be short-lived. New York state is losing two congressional seats due to decennial reapportionment, and many expect that the seat, which has been vacant since Weiner’s scandal-induced resignation, will be eliminated. New York’s 9th Congressional District has the fourth-largest Jewish population of any congressional district, with some 173,000 Jews, according to a 2009 report from the Mandell L. Berman Institute-North American Jewish Data Bank. Jerry Skurnik, a partner at the political consulting firm Prime New York, told The New York Times that about a third of the district’s active voters are Jewish. However, the district’s Jewish demographics are somewhat atypical, with sizable concentrations of Orthodox Jews and Russian Jews, who tend to lean more conservative in their voting behavior than Jews in general. During the race Weprin tried to distance himself from the president, highlighting his criticisms of the president’s policies toward Israel. According to a September poll from the Siena Research Institute, 54 percent of the district’s likely Jewish voters said they had an unfavorable view of the president, with only 42 percent viewing him favorably — figures that almost exactly matched the views of the district’s likely voters overall. The Siena poll, conducted Sept. 6-8, showed Weprin trailing Turner by six percentage points but leading among Jews by an equal margin. While the Israel issue has garnered much of the media attention, in the Siena poll only 16 percent of the district’s Jewish voters said that a candidate’s Israel stance would be the most important factor in determining their vote. That is roughly half the proportion (30 percent) who identified the candidate’s position on the economic recovery as their key issue and slightly fewer than the proportion (20 percent) who chose Social Security, Medicare and other entitlement programs as the top issue. 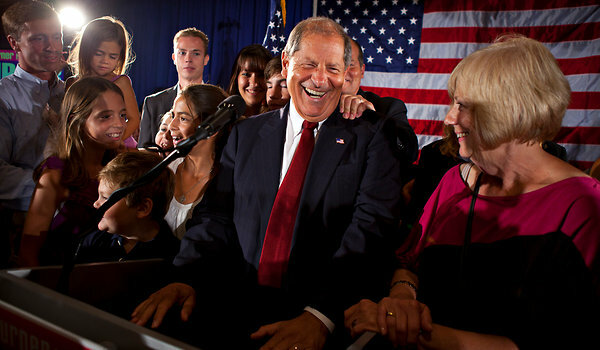 “We congratulate Bob Turner on his historic victory. This Republican win in an overwhelmingly Democrat district is a significant indicator of the problem that President Obama has in the Jewish community. While party leaders scramble to deny and try to stem the erosion of Jewish support for Democrats, the real issue is this President’s policies on Israel, on jobs, and on the economy. Jewish voters are coming to see that Republicans offer real solutions to our economic crisis, are resolute friends of Israel, and represent a way forward to a better future. Bob Turner’s win tonight has huge implications for 2012 races in states with large Jewish communities, such as Florida, Ohio, and Pennsylvania. Bob Turner, center, spoke to supporters in Queens on Tuesday. G.O.P. Gains House Seat Vacated by Weiner, AP Reports: A little-known Republican businessman from Queens, channeling voter discontent with President Obama into an upset victory, on Tuesday won election to Congress from the heavily Democratic district in New York City last represented by Anthony D. Weiner, according to The Associated Press. Turner recently polled 6 points higher than Democrat opponent David Weprin, who is actually Jewish, and narrowed Weprin’s lead among Jewish voters by 15 points. The Turner campaign sent out 5,000 letters to registered voters in Israel, asking them to register for the ballots and place them in time. “His [President Barack Obama] hostility should concern Jews, Christians, and other supporters of Israel. Many believe the president has conveyed by his actions and demands on that state that he is willing to throw it under the bus and end the special relationship which has existed between the U.S. and Israel beginning with Harry Truman and continuing through the administration of George W. Bush…. While President Obama has made demands upon Israel that affect its security, no comparable demand — indeed, no demands — have been made upon the Palestinian Authority before entering the peace talks…. Republican wins Weiner’s former seat: In a blow to Democrats, a Republican candidate captured the heavily Jewish New York City congressional district previously represented by Rep. Anthony Weiner. 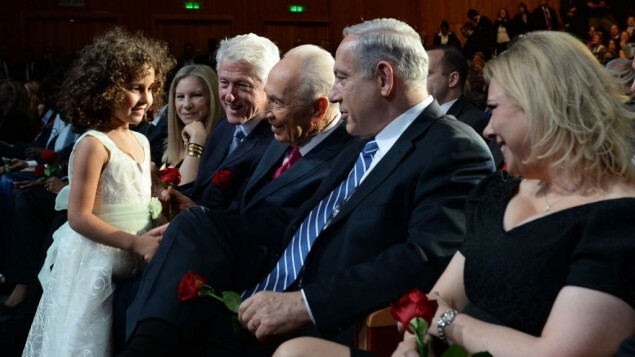 Why Obama Is Losing the Jewish Vote He doesn’t have a ‘messaging’ problem. He has a record of bad policies and anti-Israel rhetoric: New York’s special congressional election on Tuesday was the first electoral outcome directly affected by President Obama’s Israel policy. Democrats were forced to expend enormous resources to try to defend this safe Democratic district, covering Queens and Brooklyn, that Anthony Weiner won last year by a comfortable margin. A Public Policy Poll taken days before the election found a plurality of voters saying that Israel was “very important” in determining their votes. Among those voters, Republican candidate Robert Turner was winning by a 71-22 margin. Only 22% of Jewish voters approved of President Obama’s handling of Israel. Ed Koch, the Democrat and former New York mayor, endorsed Mr. Turner because he said he wanted to send a message to the president about his anti-Israel policies. Koch Played Key Role in GOP Victory: The Republican victory in New York’s solid blue 9th Congressional District seat in Tuesday’s special election came largely with the help of an influential Democrat: former New York City Mayor Ed Koch. Koch was arguably the one single factor in helping the GOP win the battle to succeed disgraced Rep. Anthony Weiner in the U.S. House. The thrice-elected former mayor, who remains a powerful force in New York and national politics, had backed Obama strongly in the 2008 election. A self-describer “liberal with reason,” former Congressman Koch holds a hawkish view on U.S. foreign policy and national security matters. In 2004, he cited the war on terror to cross party lines and back George Bush over John Kerry for the presidency. Koch campaigned for Bush’s re-election in Florida and Ohio. In the special election, the 86-year-old Koch urged fellow New Yorkers, and disaffected Democrats like himself, to send a message to President Obama that they give him a thumbs down for his domestic and foreign policies. Koch, a staunch supporter of Israel, has been dismayed with Obama’s lukewarm support for Israel. NY-9 Could Affect White House Israeli Policy: This afternoon, Ruth Lieberman, a veteran political consultant who has been helping Republican Bob Turner in his special election race to win former Rep. Anthony Weiner’s seat in New York, spoke with Townhall about the dynamics between Turner and the Jewish vote in this race and broader implications for 2012. The district shows 1/3 registered Jewish voters, but of last year’s participation in the election, a large percentage were Jewish voters, according to Lieberman. GOP Jewish group yokes NY-9 results to Obama: The Republican Jewish Coalition, which sent mailers to 30,000 Jewish homes in NY-9 in advance of the special congressional election this week, is trying to pre-frame the results as negative for President Obama, regardless of whether Democrat David Weprin wins or loses. NY special election a measure of Obama’s strength: Democrat David Weprin faced an unusually tight race against Republican Bob Turner in a special election Tuesday in New York’s heavily Democratic 9th Congressional District, where voters unhappy with President Barack Obama could elect a Republican for the first time. Assemblyman David I. Weprin had hoped to keep the Ninth Congressional District seat in Democratic hands, but failed.